Posted by OromianEconomist in Ethiopia's Colonizing Structure and the Development Problems of People of Oromia, Afar, Ogaden, Sidama, Southern Ethiopia and the Omo Valley, Land and Water Grabs in Oromia, Land Grabs in Africa, Land Grabs in Oromia. In Africa, the investigation uncovered 11 projects backed by IFC clients that have transferred approximately 700,000 hectares of land to foreign investors. The projects include agribusiness concessions in the Gambela region of Ethiopia that were cleared of their indigenous inhabitants during a massive forcible population transfer campaign in the area; oil palm plantations in Gabon that have destroyed 19,000 hectares of rainforest and infringed on the customary land rights of local communities; and a gold mine in Guinea that led to the violent forced eviction of 380 families. 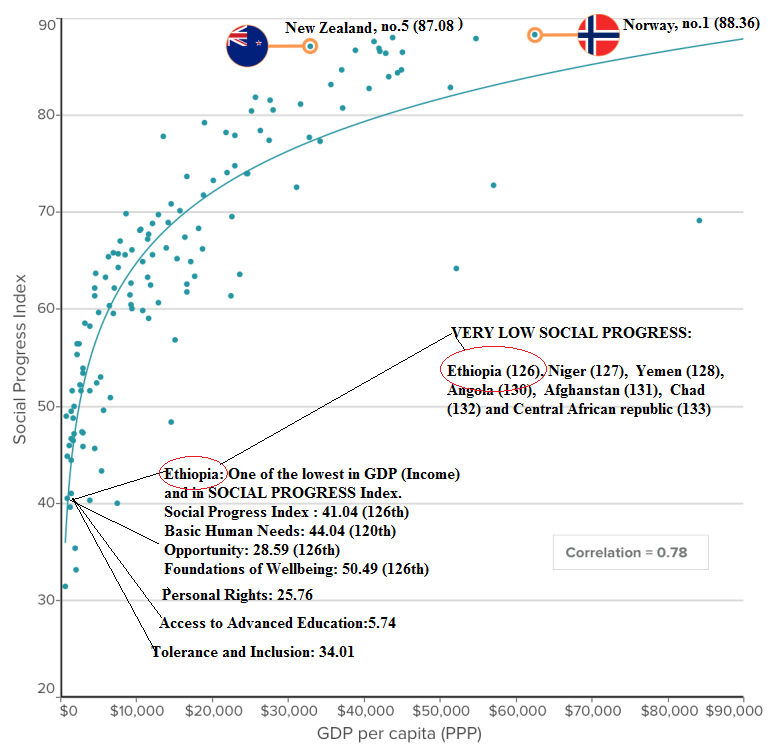 “These projects are antithetical to the World Bank’s mission of fighting poverty through sustainable development,” said David Pred, Managing Director of Inclusive Development International. 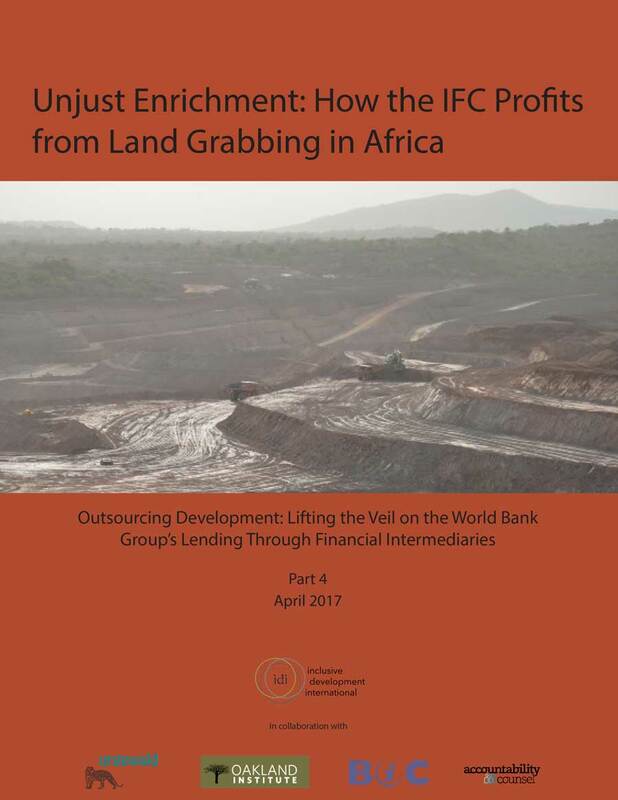 The report is the fourth of the investigative series Outsourcing Development: Lifting the Veil on the World Bank’s Lending Through Financial Intermediaries, which follows the trail of IFC money and examines at how it impacts communities around the world. Posted by OromianEconomist in #OromoProtests, Africa, Ethiopia's Colonizing Structure and the Development Problems of People of Oromia, Afar, Ogaden, Sidama, Southern Ethiopia and the Omo Valley, Ethnic Cleansing, Land Grabs in Africa, Land Grabs in Oromia, Oromia, Oromo. (Bloomberg business) — When Ethiopian farmer Mulugeta Mezemir ceded his land three years ago to property developers on the fringes of the expanding capital, Addis Ababa, he felt he had no choice. 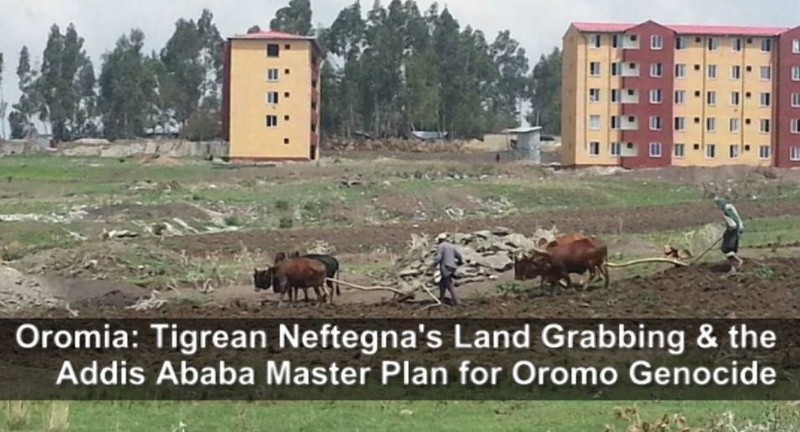 A gated community with white picket fences and mock Roman pillars built by Country Club Developers now occupies the fields he tilled in Legetafo, Oromia region, after the 60-year-old said local government officials convinced him to accept an offer or face expropriation. He took the cash and vacated the land, which in Ethiopia is all state-owned. As Ethiopia, which the International Monetary Fund estimates saw 8.7 percent economic growth in the last fiscal year, undergoes a construction boom, complaints over evictions and unfair compensation have fomented the country’s most serious domestic political crisis in a decade. In protests by the largest ethnic group, the Oromo, that began in November, security forces allegedly shot dead as many as 266 demonstrators, according to the Kenya-based Ethiopian Human Rights Project. The government says many people died, including security officers, without giving a toll. Foreign investors including Dangote Cement Plc had property damaged. Ethiopian Communication Minister Getachew Reda said protesters were in part angry at “some crooked officials” who have been “lining their pockets by manipulating” land deals around the capital. Property developers CCD followed legal procedures, paid standard rates of compensation and employed many members of farmers’ families, according to Tedros Messele, a member of the company’s management team. Cases such as Mulugeta’s have been a growing trend on the outskirts of the capital over the past two decades, said Nemera Mamo, an economist at Sussex University in England. No recent, independent studies have been conducted into how many people have been affected. Ethiopia’s state-heavy model seeks to industrialize the impoverished nation within a decade by improving infrastructure and combining investment with cheap labor, land and water to produce higher-value goods. Projects for what the IMF calls African’s fastest-growing economy include the continent’s largest hydropower dam, railways and the building of 700,000 low-cost apartments by 2020. Construction accounted for more than half of all industry in the fiscal year that ended in July after it grew an annual 37 percent, according to National Bank of Ethiopia data. Industry comprised 15 percent of output. Investors such as Diageo Plc, the world’s largest liquor maker, and Unilever Plc are tapping into the expansion by building Ethiopian facilities. Citizens of Africa’s second-most populous nation are using money earned there or abroad to build residences, malls and offices. The ruling party hasn’t kept pace with the boom by improving governance and the ability of domestic manufacturers to supply the industry, said Tsedeke Yihune, who owns Flintstone Engineering, an Ethiopian contractor that’s built upmarket housing and African Union offices. “Construction has not been used as it was supposed to, as a means of building domestic capacity, building good governance, as well as delivering the government’s development agenda,” Tsedeke said in an interview in the capital. More than 70 percent of construction materials are imported, including cables, steel, ceramics, locks, furniture and electrical fittings, Tsedeke said. 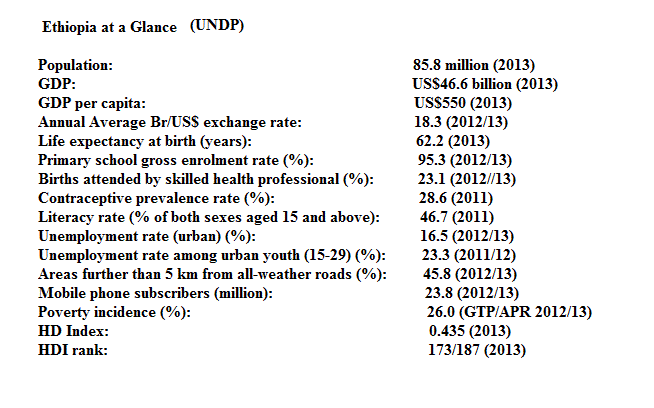 Ethiopia’s trade deficit increased by $3 billion to $14.5 billion last fiscal year. 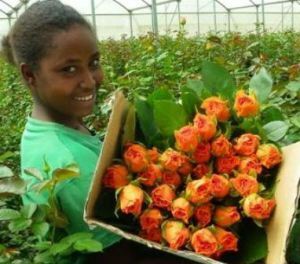 Addis Ababa-based Orchid Business Group is another recipient of government capital spending, which the IMF says could double to almost $15 billion a year by 2020. Orchid’s projects include one with Italy’s Salini Impregilo SpA building the Grand Ethiopian Renaissance Dam, said Hailealem Worku, the construction and engineering head. Cement plants built by companies including Dangote have made Ethiopia self-sufficient in the material, while manufacturing incentives means glass, paint and steel factories will play a bigger role soon, Hailealem said. The government wants to improve regulations and change attitudes so contractors boost their skills and ethics, Construction Minister Ambachew Mekonnen said in an interview. “The construction industry suffers from a lack of good governance,” he said. In Legetafo, Mulugeta was paid 17 birr ($0.80) a square meter in compensation. Meanwhile, people were bidding as much as 355,555 birr per meter to rent land in Addis Ababa last year. Mulugeta used the 200,000 birr he received for the plot for expenses including renting more farmland. Two of his children now work as CCD cleaners, earning 40 birr a day. “We are getting deeper into poverty,” he said. Posted by OromianEconomist in #OromoProtests, Africa, Indigenous People, Land Grabs in Africa, Land Grabs in Oromia, Oromia. Washington, D.C.—Since 2000, more than 36 million hectares—an area about the size of Japan—has been purchased or leased by foreign entities, mostly for agricultural use. Today, nearly 15 million hectares more is under negotiation (www.worldwatch.org). “Farmland is lost or degraded on every continent, while ‘land grabbing’—the purchase or lease of agricultural land by foreign interests—has emerged as a threat to food security in several countries,” writes Gary Gardner, contributing author of the Worldwatch Institute’s State of the World 2015: Confronting Hidden Threats to Sustainability. About half of grabbed land is intended exclusively for use in agriculture, while another 25 percent is intended for a mix of agricultural and other uses. (The land that is not used for agriculture is often used for forestry.) Land grabbing has surged since 2005 in response to a food price crisis and the growing demand for biofuels in the United States and the European Union. Droughts in the United States, Argentina, and Australia, has further driven interest in land overseas. “Today, the FAO reports that essentially no additional suitable [agricultural] land remains in a belt around much of the middle of the planet,” writes Gardner. As a result, the largest grabbers of land are often countries that need additional resources to meet growing demands. Over half of the global grabbed land is in Africa, especially in water-rich countries like the Congo. Asia comes second, contributing over 6 million hectares, mainly from Indonesia. The largest area acquired from a single country is in Papua New Guinea, with nearly 4 million hectares (over 8 percent of the country’s total land cover) sold or leased out. Land grabbing is precipitated by the growing challenges shaking the foundation of food production: the water, land, and climate that make crop growth possible. Globally, some 20 percent of aquifers are being pumped faster than they are recharged by rainfall, stressing many key food-producing areas. Land is becoming degraded through erosion and salinization or is getting paved for development. The changing climate is projected to cause a net decline of 0.2–2 percent in crop yields per decade over the remainder of the century, according to the Intergovernmental Panel on Climate Change. The dangers of land grabbing are evident. Large-scale purchases often do not consider the interests of smallholders who may have been working the land over a long period. Additionally, the transfer of resources from poorer countries to wealthier ones increases the vulnerability of the target countries that surrender their own access to land and water resources to foreign investors and governments. “As demand for agricultural goods increases, and as our planet’s water and fertile land become more scarce and its atmosphere less stable, greater effort will be needed to conserve resources and to exploit opportunities for greater efficiency throughout the agricultural system,” writes Gardner. By preventing food waste, increasing water efficiency, conserving agricultural land, and decreasing production of meat and biofuels (both of which require large quantities of land and water for grain or crops), Gardner believes that the stress on food systems can be reduced. In addition, the international adoption of the right to food, already integrated in the constitutions of 28 countries, will ensure that food cannot be withheld for political reasons. Posted by OromianEconomist in Africa, Land Grabs in Africa, Land Grabs in Oromia, Omo Valley. 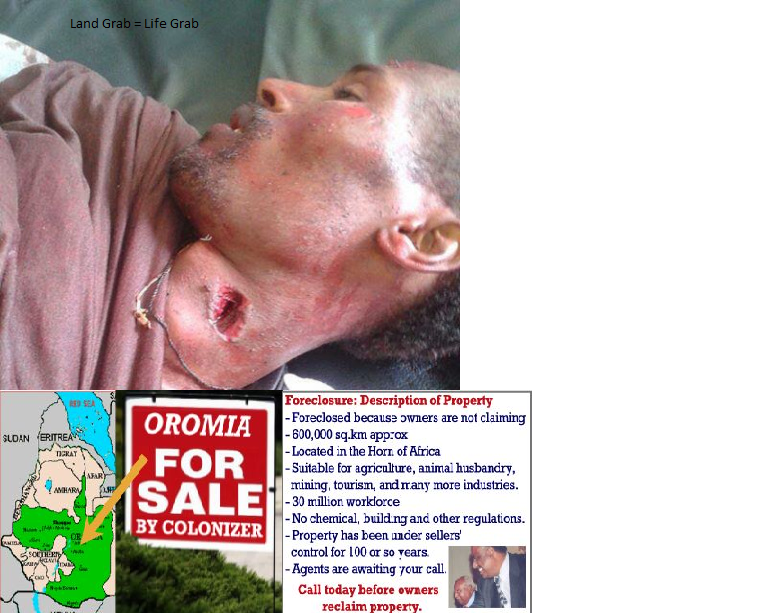 Posted by OromianEconomist in Africa, Because I am Oromo, Ethnic Cleansing, Land Grabs in Oromia, Omo Valley. 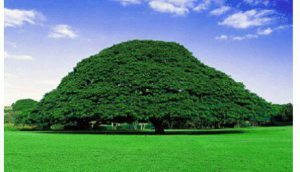 Wallagga, Aanaa Nuunnuu Qumbaa Ganda qonnaan bultaa Furdisaa lafa qonnaa fi bososna Baanqoo jedhamu mootummaa Wayyaanee investerootaaf hiruu isaa irraan kan ka’e uummanni Oromoo naannichaa diddaa fi falmatnaa dachii isaanii taasisaniin ergamtootaa fi bulchitoota Wayyaanee waliin walitti bu’uu Qeerroon gabaase. Gaafa Ebla 19,2015 Diddaa uummanni naannoo kanaa kaaseen wal qabatee mootummaan Wayyaanee loltoota isaa Naqamte irraa gara naannichaatti erguun fincila kaafatniittu, dachii mootummaan irraa buqaaa isiniin jedhe irraa ka’uu diddan sababoota jedhuun abbootii warraa kanneen ta’an qonnaan saddeettamaa ol manneen hidhaa beekamtii hin qabne kan akka Waamaa Adaree,magaalaa Nuunnuu, mana hidhaa Jimmaa Arjoo fi Jaatoo Naqamteetti guuramanii hidhamuu isaanii Qeerroon addeessa. Jedhaman yeroo ta’an hidhamtoota warreen hafan kaan keessas shamarran Oromoo maatii qonnaan bulaa keessaa akka keessatti argaman gabaasi addeessa. The Kwegu people of Ethiopia’s Lower Omo Valley are facing starvation because of the loss of their land to a huge sugar plantation, the destruction of their forest and the damming of the Omo river – supported by a UK, EU and World Bank funded ‘aid’ program. There has been almost no consultation of the indigenous peoples of the Lower Omo Valley about these projects on their land, and resistance is met with brutal force and intimidation. Local sources report that the Kwegu, the smallest and most vulnerable tribe inEthiopia’s Lower Omo Valley, are suffering severe shortages of food and facing starvation. The situation follows from the enclosure of much of their land for the huge Kuraz sugar plantation, the destruction of their forest and the damming of the river on which they depend for fish and flood irrigation of crops. 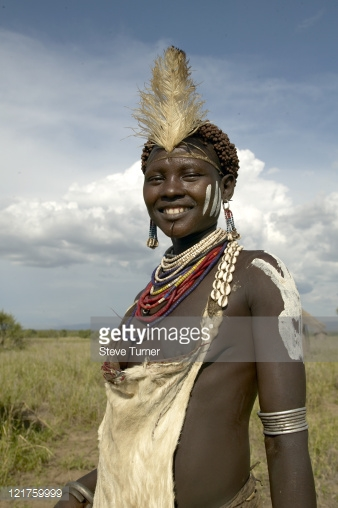 The Kwegu, believed to number no more than 1,000, hunt, fish and grow crops along the banks of the Omo River. Although the smallest of the indigenous tribes of the Omo valley, they are the original people of the area who have lived there, according to our source,“since time immemorial”. Now the massive Gibe III dam and associated large-scale irrigation infrastructure for commercial plantations on their land and that of other ethnic groups has stopped the Omo River’s regular annual floods. The alarm has been raised by Survival International, which campaigns for the rights of Indigenous Peoples. Normally the Kwegu grow crops of sorgum, maize and ‘green gram’, a protein-rich lentil, on land moistened and fertilized by the receding flood waters. But last year’s flood never took place as the water instead went to fill the Gibe III reservoir – as confirmed by recent satellite images. Fish stocks on the Omo river are also greatly depleted as a result of the low flows on the river and the total failure of the annual flood. As well as farming, the Kwegu also maintain a hunter-gatherer lifestyle, eating a wide range of foods including wild fruits and leaves, insects including termites, wild animals and mushroms. Another delicacy is honey from their hives. But they have been cut off from most of these food sources after their land was taken by force for the Kuraz plantation. The Kwegu have become dependent on food from neighboring tribes to survive, notably the Bodi, a pastoralist tribe with a long history of cooperation with the Kwegu. But the Bodi themselves are in an unsustainable position, as much of their grazing land has also been taken for the Kuraz plantation and their remaining pastures have also suffered from the absence of flooding. Maybe we will die Kwegu tribespeople in Ethiopia’s Lower Omo Valley report that they are starving as a result of being forced from their land and of the irrigated plantations that are drying up the river on which they depend. Filmed in 2012, during the clearing of their land for a government sugar plantation. Army units have been despatched to the Omo valley to quell opposition to the Gibe III dam and the Kuraz sugar plantation, and local sources report that soldiers have raped indigenous women and imprisoned both men and women for voicing their objections. Several tribes are being forcibly settled by the government in a process known as ‘villagization’, which has received financial support from a massive $4.9 billion World Bank program called ‘Promoting Basic Services‘ (PBS), to which the UK government has committed almost $780 million, and the European Commission $66 million. Ethiopia is one of the largest recipients of US, UK and German aid. DfID, the UK’s donor agency, recently announced it will stop funding the PBS program which has been linked to the forced resettlement of tribes in the Omo Valley. However, the UK has not reduced the total amount of its aid to Ethiopia and makes no reference to the resettlement program. 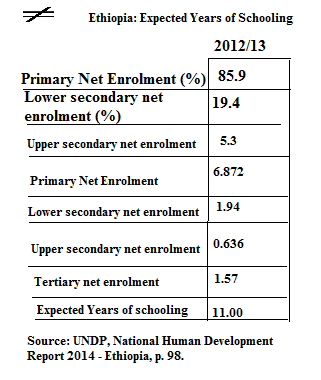 DfID’s total aid budget for Ethiopia is £368,424,853 for 2014/2015. The report of a donor mission to the area in August 2014 by the Development Assistance Group – a consortium of the largest donors to Ethiopia including USA, the UK, Germany and the World Bank – has not been released, despite the growing humanitarian crisis in the Lower Omo. Stephen Corry, Director of Survival, said: “Donor agencies need to reform to ensure taxpayers’ money is not spent propping up governments responsible for evicting tribal peoples from their lands. 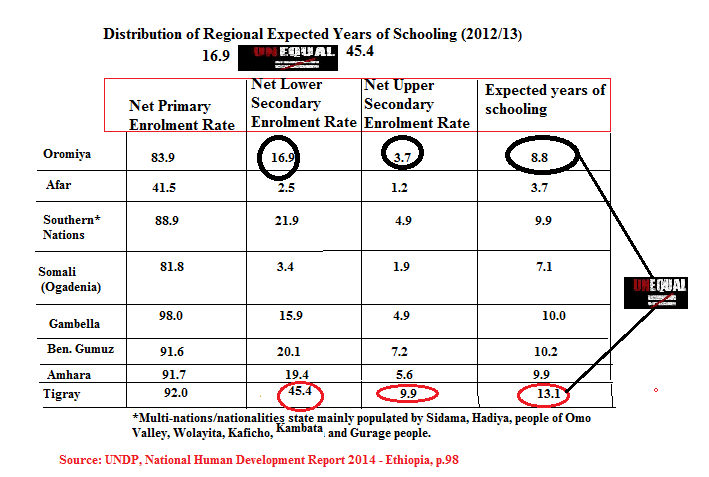 Posted by OromianEconomist in Ethiopia's Colonizing Structure and the Development Problems of People of Oromia, Afar, Ogaden, Sidama, Southern Ethiopia and the Omo Valley, Finfinnee n Kan Oromoo ti, Genocidal Master plan of Ethiopia, Janjaweed Style Liyu Police of Ethiopia, Jen & Josh (Ijoollee Amboo), No to land grabs in Oromia, No to the Addis Ababa Master Plan, NO to the Evictions of Oromo Nationals from Finfinnee (Central Oromia). Few months ago, in an interview with journalist Befekadu Moroda of Oromia Media Network (OMN), I asserted that TPLF and the Tigrean ruling class have transformed into Neftegna. Abay Tsehaye’s recent words and behavior testament to that. Remember the Neftegna system that gave monopoly over the means of violence and the sources of wealth produced chauvinistic agents who exploited and disrespected oppressed groups in Ethiopia. The system also engineered social behaviors that justified the actions of those agents and popularized myths of the dominant groups socio-cultural superiority. Overtime, the ruling class and its base began rationalizing and institutionalizing prejudice and extreme form of violent responses towards those who dissented. During the early years of their rule, as violent and oppressive they were, TPLF differentiated themselves from their predecessors by being sensitive and showing reasonable respect for groups they subjected. However, they began abandoning such sensitivity as they consolidated power and began amassing wealth, and they have started adopting the ugly behaviors of their predecessors. Nowadays, emboldened by the absolute monopoly of the means of violence, intoxicated with abundance of wealth at their disposal and facing no so significant threat to their rule, the TPLF Tigrean rulers’ rudeness, arrogance and disrespect for other cultures have become their norm. Just like their predecessors, they have the false sense of inherent superiority which had made them feel invincible. This behavior is even worse among their rising generation – which was born into wealth and power and grew up being drugged with post-victory (post-1991) bravado of TPLF. Abay Tsehaye’s “Liyu” Force was responsible for the Mayu Muluqqee and other massacres and uprooting of Oromos in Eastern Oromia over the last two years. The “Liyu” Force conducted military raids on innocent Oromo farmers in Eastern Oromia to rob them of their land. 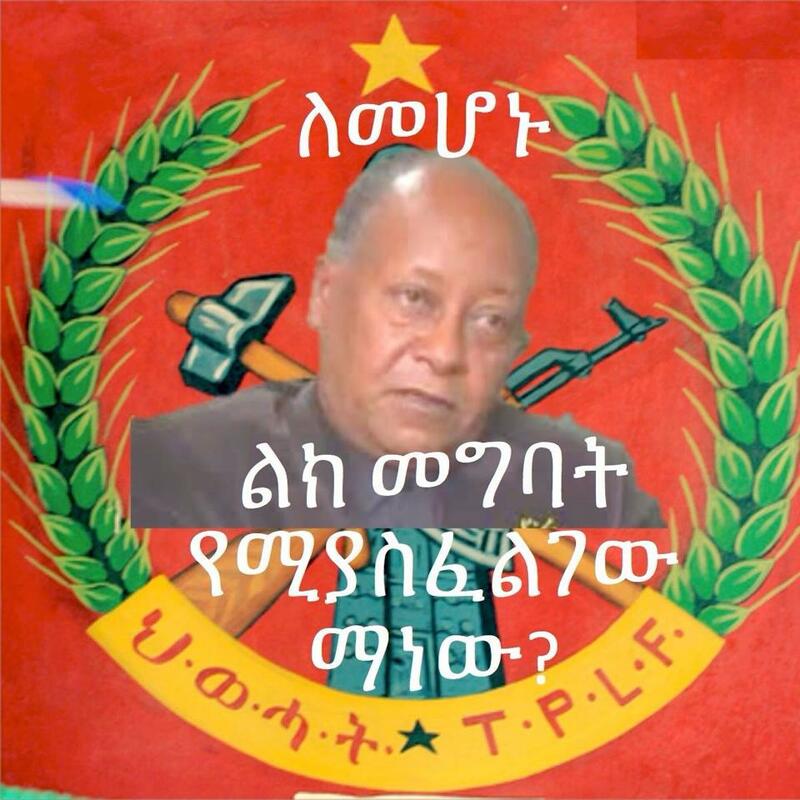 Abay Tsehaye’s “Liyu” Force was also behind the Asabot/Miesso attacks in Chercher in Oromia. He’s also the main TPLF agent behind the tribal conflicts in Moyale and other areas on the Southern Oromian and Kenyan border. In addition to the Mayu Muluqqee Massacres, Abay Tsehaye’s militarized land-grabbing expeditions are well documented in Gambella, Omo region, Afar – and even in the Amhara region (he was in charge of the plan to turn the Waldiba Monastery in the Amhara region into a commercial sugar farming). ogganni Ol-Aanaa EPRDF/TPLF Abbooy Tsahaye Jechoota Jajjaboon Uumata Oromoo fi Garee Ofiin Bulchan OPDO Arrrabse. Hogganaan Sirna of tuulaa Wayyaanee EPRDF/TPLF Olaanaa Abbaay Tsahaye jechoota dhiiga nama danfisuun uummata Oromoo hundaa arrrabse. Addatti immoo OPDO hidhee reebuuf akka niitii isatti biroo isatti olgachee doorsisaa jirachuu ifatti ibsame jira. Sababaan guddaan hogganootni Abbaa Irree Wayyaanee EPRDF/TPLF gaaffii mirgaa abbaa biyyummaa fi karoora Oromoo lafa irraa baalleessuuf maqaa ‘’master plan Finfinnee’’ jedhuun duula Oromoo qe’ee irraa buqqisuu, aadaa Oromoo balleessuu, afaan Oromoo quucarsuu,lafa Oromoo irraa fudhachuun uummata isaanii fidanii irra qubsiisuuf karoorfatan irratti mormii guddaa kaachisuun hoggansii sochii dargaggoota Qeerroo barattoota Oromoo FDG irratti dhoosuun wareegama qaalii itti kanfalaa jiraachuun walqabatee, yaaddoo fi dhiphina hamaa hogganoota EPRDF/TPLF mudateen waan qabanii gadhiisan dhabuun jecha Ilma namaa irraa hin egamneen uummata Oromoo arbsaa jiraachuu hoggansii qeerroo bilisummaa Oromoo gadi jabeessuu balaaleffate sochii wayyaanee kana dura dhaabbachuun wareegama qaalii kanfaluuf qophii ta’uu uummata Oromoo hundaaf ibsa godhe jira. Sirna mootummaa Wayyaanee hundeen buqqisuuf walcina dhaabbatnee mirga keenyaa fi eenyummaa keenya kabachiifachuuf harka walqabatnee wayyaanee irratti FDG itti fufinsa qabuu haa gaggeessinu. Oromoo qe’ee kee irratti, qabeenyaadhuma kee irratti diinni lokkofsa hin guutne qaawwee dahoo godhatee jecha ilma namaa irraa hin eegamneen sii arrabsuu fi uummata guddaa kana sii tuffachuun wayyaaneef kufaatii isa dhumaa ta’uu qaba. Jaarmiyaalee qabsoo bilisummaa Oromoo hundaaf Wayyaanee waliin karaa nagaa qabsaa’uu fi jiraachuun tasumaa akka hin danda’amne jarmiyaaleen qabsoo bilisummaa Oromoo beekuu fi hubachuu qabu wayyaaneen hardha maqaa dimookiraasii sobaa fi filmaata dharaa gaggeessuuf dhaadachaa jiruu kaleessaa fi hardha uummaata Oromoo karaa nagaa fi dimookiraasii gaaffii mirgaa abbaa biyyummaa gaafachaa jiruu julmaan ajjeesuun yakka genocide Oromoo irratti gaggeessa jira, ilmaan Oromoo kumoota dhibbaan lakka’aman hidhatti guuree darara jira, barattoota Oromoo qalama malee homaa of harkaa hin qabne rasasaan tumee ajjeesaa jira, barnoota irraa arii’achaa jira, Oromoo tuffachuun jecha ilma namaa irraa hin eegamneen Oromoo arrabsaa jira, Oromoon kana hundaa utuu arguu wayyaanee waliin jiraachuun yakka seenaan dhiifama gochuufi hin dandeenye keessa seenuudha. Kanaafuu uummatni Oromoo fi Jaarmiyaaleen Siyaasa Oromoo wal hubachuun mirga Oromoo kabachiisuuf gara dirree FDGtti akka makamtan Qeerroon Bilisummaa Oromoo waamicha dabarsa. ማስተር ፕላኑንም ሆነ የነበረውን የመሬት ወረራ ፊት አውራሪ ሆነ እየመረ ያለው የአዲስ አበባ መንገዶች ባለስልጣን ነው፡፡ እስቲ በማን ጥያቄ ነው በሉዓላዊ ክልል ውስጥ ገብቶ በአርሶ አደር ማሳ ውስጥ በመጋለብ መንገድ እየሰረ ያለው? 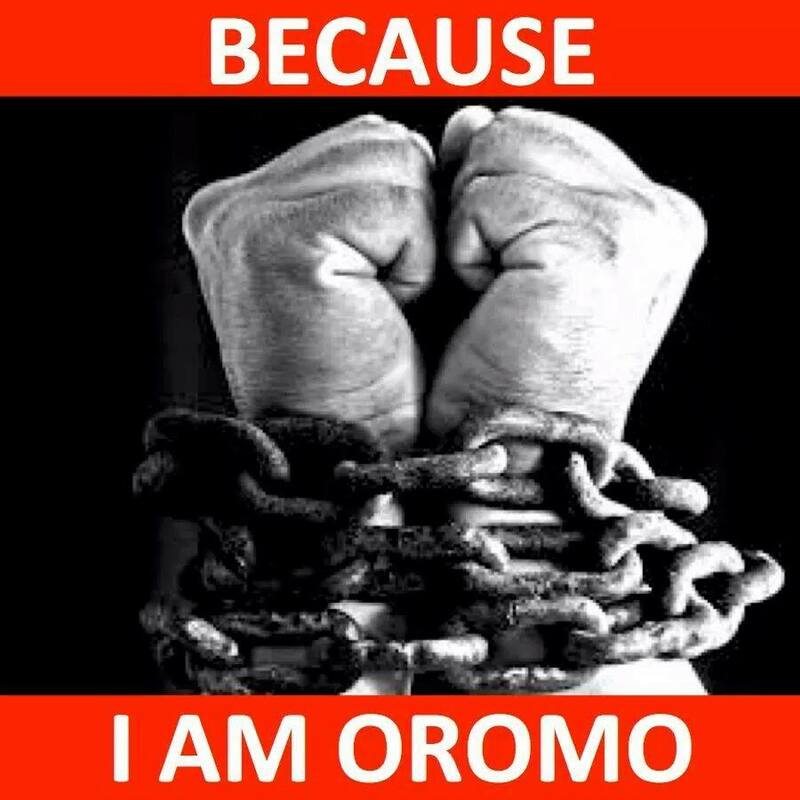 Posted by OromianEconomist in Because I am Oromo, Ethiopia's Colonizing Structure and the Development Problems of People of Oromia, Land and Water Grabs in Oromia, Land Grabs in Africa, Land Grabs in Oromia, No to land grabs in Oromia, No to the Addis Ababa Master Plan, Uncategorized. Aduna Workneh, father of five, lives across bunches of flower farms near Addis Ababa. Officials from the government and flower farms came and talked to him in person. They told me I will benefit better if I take the offer from the government and leave my land. Initially, I refused the offer – because they money would feed my family for a few years, but my land will feed till the ages of my grandchildren and even beyond.” However, Aduna was forced to take the offer and he is now a landless man. He is not sure about his future. These flower farms benefit us nothing; at least they were expected to provides employment opportunity, says Aduna. Only a few members of our community got employed; as for the majority are not from this area. Showing across the valley, Aduna says – this whole valley was covered by indigenous trees – now is cut down and green houses have been constructed on them. We were able to collect firewood from leftovers and foliage in the forest – the flower farms have taken away everything from us. Posted by OromianEconomist in Africa, Africa Rising, African Poor, Agriculture, Ethiopia's Colonizing Structure and the Development Problems of People of Oromia, Afar, Ogaden, Sidama, Southern Ethiopia and the Omo Valley, Land Grabs in Africa, Land Grabs in Oromia. An opinion piece by GRAIN published by Reuters. The United Nations declared 2014 as the International Year of Family Farming. 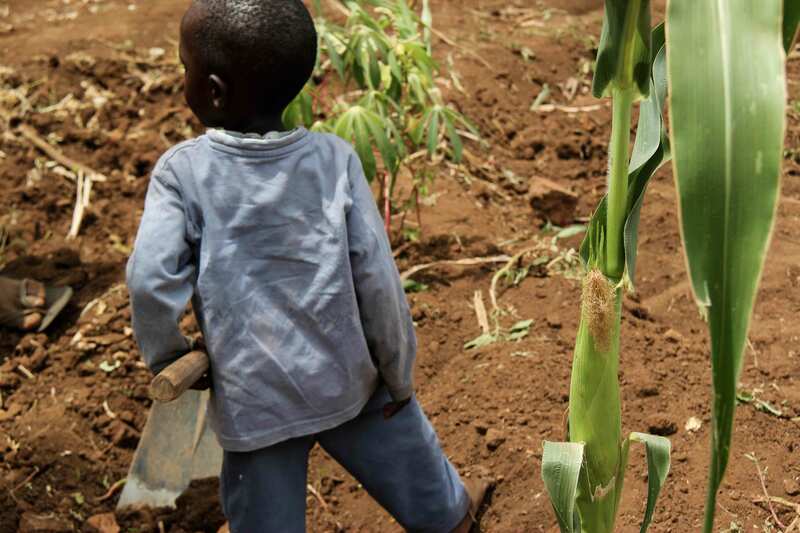 As part of the celebrations, the U.N. Food and Agriculture Organisation (FAO) released its annual “State of Food and Agriculture”, which this year is dedicated to family farming. Family farmers, FAO say, manage 70-80 percent of the world’s farmland and produce 80 percent of the world’s food. A recent comprehensive survey by GRAIN, examining data from around the world, finds that while small farmers feed the world, they are doing so with just 24 percent of the world’s farmland – or 17 percent if you leave out China and India. GRAIN’s report also shows that this meagre share is shrinking fast.How, then, can FAO claim that family farms occupy 70 to 80 percent of the world’s farmland? In the same report, FAO claims that only 1 percent of all farms in the world are larger than 50 hectares, and that these few farms control 65 percent of the world’s farmland, a figure much more in line with GRAIN’s findings. Thus, a huge industrial soya bean farm in rural Argentina, whose family owners live in Buenos Aires, is included in FAO’s count of “family farms”. What about sprawling Hacienda Luisita, owned by the powerful Cojuanco family in the Philippines and epicentre of the country’s battle for agrarian reform since decades. Is that a family farm? In the last 50 years, a staggering 140 million hectares – the size of almost all the farmland in India — has been taken over by four industrial crops: soya bean, oil palm, rapeseed and sugar cane. And this trend is accelerating. In the next few decades, experts predict that the global area planted to oil palm willdouble, while the soybean area will grow by a third.These crops don’t feed people. They are grown to feed the agroindustrial complex. If the current processes of land concentration continue, then no matter how hard-working, efficient and productive they are, small farmers will simply not be able to carry on. The data show that the concentration of farmland in fewer and fewer hands is directly related to the increasing number of people going hungry every day. According to one U.N. study, active policies supporting small producers and agro-ecological farming methods could double global food production in a decade and enable small farmers to continue to produce and utilise biodiversity, maintain ecosystems and local economies, while multiplying and strengthening meaningful work opportunities and social cohesion in rural areas. Posted by OromianEconomist in Africa, Africa Rising, Ethiopia's Colonizing Structure and the Development Problems of People of Oromia, Afar, Ogaden, Sidama, Southern Ethiopia and the Omo Valley, Land Grabs in Africa, Land Grabs in Oromia, No to land grabs in Oromia, Oromians Protests, Oromo students protests, The Tyranny of Ethiopia. Triangle between corporations, government and farmers. LAND GRABBING OR LAND TO INVESTORS ? October 2, 2014 (Farmlandgrab) — In Ethiopia, more than six million people survive because of UN food aid, while agricultural products cultivated on land leased to foreign investors are exported. A paradox. These land use decisions are made far from the land itself, and far from the people whose lives are rooted in it. The video below explores the phenomenon of land grabs through the eyes of foreign investors, governments and the people on the land. Images from this video also appeared at the Photoville Festival in Brooklyn, NY. There Grassroots International and allies participated in a panel discussion “Land Grabbing: Raising Awareness with Multimedia” on September 21, 2014. *Alfredo Bini is a photojournalist and has found his own personal form of expression in reportage photography. His work has been on show in exhibitions and photography festivals worldwide. His reportages won national and international awards and are used as debating material for presentations and conferences in public venues, universities and on TV news programs. He is represented by the Paris based Cosmos Photo agency. 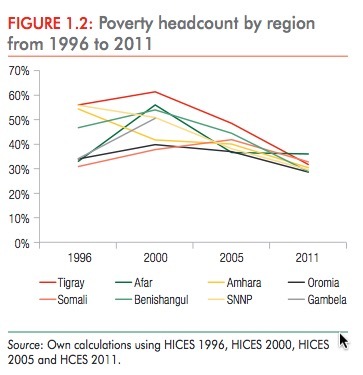 Posted by OromianEconomist in Africa, Colonizing Structure, Corruption, Ethiopia's Colonizing Structure and the Development Problems of People of Oromia, Ethiopia's Colonizing Structure and the Development Problems of People of Oromia, Afar, Ogaden, Sidama, Southern Ethiopia and the Omo Valley, Free development vs authoritarian model, Genocidal Master plan of Ethiopia, Human Rights Watch on Human Rights Violations Against Oromo People by TPLF Ethiopia, Land Grabs in Oromia, Oromo Protests, Oromo Protests in Ambo, Southern Ethiopia and the Omo Valley, Stop evicting Oromo people from Cities, The Colonizing Structure & The Development Problems of Oromia, The extents and dimensions of poverty in Ethiopia, The Tyranny of Ethiopia. Land grabbing increased in 2008, when price shocks in the food market alerted the world to the finite limits of food production. From this came a rush to acquire farmland all over the globe and a dramatic increase in the value of arable land. “Land acquisitions,” as they are termed by their proponents, are the latest weapon in the arsenal of conventional development. Although it is claimed that they alleviate poverty and increase technological transfer, employment, and food security, the “grabs” have a range of other motives. Some are politically driven, some provide new markets for corporations, others provide food security for far-off nations. The “grabbers” range from elite businessmen to governments to multinational corporations and are not defined by any one particular demographic. In Tanzania, the wild Serengeti Desert, home to elephants, lions and a host of other magnificent wildlife, is being carved up as Middle Eastern businessmen purchase huge parcels of land for private hunting rights. The Serengeti is home to the pastoral Masai people, who are now restricted to smaller and smaller territories. As a result they are not only being criminalized for trespassing on their ancestral lands, they are accused of over-grazing and degrading ecosystems as their herds no longer have enough room to graze without impacting grasslands. In recent years, foreign governments and multinational corporations have bought or leased huge tracts of sovereign land in the developing world, converting much of it to industrialized agriculture for export. This “land grabbing” – now widespread across Africa and Asia – is most common in nations with the least secure land tenure systems. Usually the land transfers involve land occupied by indigenous communities; often they are not legally registered as landholders and can be easily evicted. In terms of both ecological and cultural impacts, land grabbing has emerged as one of the most painful manifestations of the globalized economy in the 21stCentury. Land grabbing increased in 2008, when price shocks in the food market alerted the world to the finite limits of food production. From this came a rush to acquire farmland all over the globe and a dramatic increase in the value of arable land. “Land acquisitions,” as they are termed by their proponents, are the latest weapon in the arsenal of conventional development. Although it is claimed that they alleviate poverty and increase technological transfer, employment, and food security, the “grabs” have a range of other motives. Some are politically driven, some provide new markets for corporations, others provide food security for far-off nations. The “grabbers” range from elite businessmen to governments to multinational corporations and are not defined by any one particular demographic. Many organizations have attempted to estimate how many acres are involved, though there is no central registry and little transparency. The World Bank claimed 120 million acres were transferred in 2010, while Oxfam gave a figure of 560 million acres*. In nearby Ethiopia, the government of the Gambela region has enacted a “Villagization” program that promises new schools, wells, medical facilities, and general infrastructure to relocated communities. Unfortunately, these promises have rarely materialized and more often than not the “villagization” process has resembled the violent forcing of communities into state-designated camps, in a process that is clearing the way for foreign agribusiness. Those that stay put in their ancestral homes often find themselves surrounded by new plantations. Two concessions of 25,000 acres and 250,000 acres are currently under development by a Saudi oil billionaire and an Indian flower agribusiness for 60 and 50 years, respectively. The latter, Karuturi Global, is growing oil palm, corn, sorghum, rice, and sugarcane for export back to India, using a labor pool comprised primarily of Indians or Ethiopians from other regions. Karuturi Global pays a measly $2.50 per acre annually – little to none of which is seen by local residents. A few local tribespeople now work for the company, although this is usually because they were left with no choice, their own land having been taken or degraded. These tribespeople used to earn their livelihoods by hunting, fishing, and making honey. When the company began cutting down the forest the bees and the animals vanished; now that the company has started draining the wetlands, the fish will soon be gone too. In Sri Lanka, instability has given land grabbers the advantage as the country transitions out of a bloody 30-year civil war. During the conflict, the Sinhala Buddhist government claimed several large pieces of land as High Security Zones (HSZ), conveniently located in Tamil territories. In these seizures, local families were evicted from their lands in the name of security. Now that the war is over, the validity of the HSZs has come into question, but instead of returning the land to its original tenders, the government is converting many of the HSZs into Economic Processing Zones and Special Economic Zones, commonly contracting them out to large Chinese and Vietnamese corporations. Meanwhile, hundreds of thousands of Sri Lankan Tamils are relegated to “displaced person camps” with little or no access to resources. These are only a few of the heart-wrenching examples of land deals across the globe. Large-scale land transfers like these remove all human connection from land management. If the land grabbing trend continues, we could be witnessing the true end of the commons everywhere. While proponents claim that these land acquisitions provide development to needy regions in the form of technology transfer and employment, these lofty claims require scrutiny. Is this kind of “employment” what is needed or desired among local people? How will technology transfer help them and what kind of technology is needed? In a region thriving on small-scale farming, are large tractors and bulldozers really of any benefit? First and foremost, what local peo ple need to prosper are secure land rights. Then they can make choices about the technologies they want to adopt, and about how their land can be managed for the benefit of the local communities, economies and ecosystems. To this end, we need an international legal framework that restricts and regulates the ability of foreign businesses to acquire land. Regulations need to limit the size of land deals, ensuring accountability and justice for the communities and ecosystems impacted. *Sophie Weiss is an intern with Local Futures. She graduated with a BA concentration in Geography/International Development Studies from Sarah Lawrence College. She is a printmaker, designer, and critical geography researcher, focusing on indigenous land rights and anti-land grab advocacy for the Oakland Institute, a policy think tank based in Oakland, California.